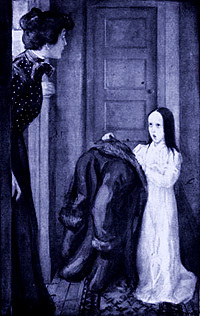 This one concerns a little girl ghost who cannot find her mother. Nala the Official Halloween Cat does not find this story to her liking as it involves the spectral pulling of an innocent cat’s tail, but we hope you otherwise enjoy. “Did you really live in a house that was—“ she whispered fearfully. “Well, I went there to teach school, and I went to board with a Mrs. Amelia Dennison and her sister, Mrs. Bird. Abby, her name was—Abby Bird. She was a widow; she had never had any children. She had a little money—Mrs. Dennison didn’t have any—and she had come to East Wilmington and bought the house they lived in. It was a real pretty house, though it was very old and run down. It had cost Mrs. Bird a good deal to put it in order. I guess that was the reason they took me to board. I guess they thought it would help along a little. I guess what I paid for my board about kept us all in victuals. Mrs. Bird had enough to live on if they were careful, but she had spent so much fixing up the old house that they must have been a little pinched for awhile. “Well, I went there in September. I begun my school the first Monday. I remember it was a real cold fall, there was a frost the middle of September, and I had to put on my winter coat. I remember when I came home that night (let me see, I began school on a Monday, and that was two weeks from the next Thursday), I took off my coat downstairs and laid it on the table in the front entry. 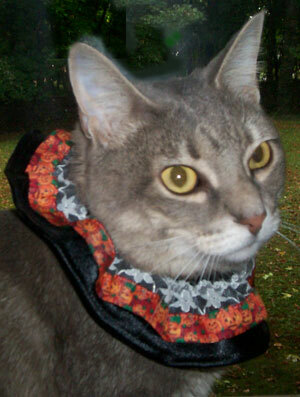 It was a real nice coat—heavy black broadcloth trimmed with fur; I had had it the winter before. Mrs. Bird called after me as I went upstairs that I ought not to leave it in the front entry for fear somebody might come in and take it, but I only laughed and called back to her that I wasn’t afraid. I never was much afraid of burglars. “’ ‘Who are you?’ says I again, looking at her. “’What are you?’ says I. Then she went away. She did not seem to run or walk like other children. She flitted, like one of those little filmy white butterflies, that don’t seem like real ones they are so light, and move as if they had no weight. But she looked back from the head of the stairs. ‘I can’t find my mother,’ said she, and I never heard such a voice. “’Who is your mother?’ says I, but she was gone. “’What is it, dear?’ asked Mrs. Bird, and her pretty, loving voice had a strained sound. I saw her look at Mrs. Dennison and I saw Mrs. Dennison look back at her. “ ‘What was it like?’ asked Mrs. Dennison in a sort of failing voice, and she looked at her sister again and her sister looked back at her. “’I’ll be real careful,’ says I. I knew she set a sight by that painted tumbler. “ ‘I’m all over it now,’ says she, but she was terribly white, and her eyes looked as if they saw something outside things. Mrs. Bird wasn’t much better, but she always had a sort of settled sweet, good look that nothing could disturb to any great extent. I knew I looked dreadful, for I caught a glimpse of myself in the glass, and I would hardly have known who it was. “’That isn’t much,’ said Mrs. Dennison with a dying-away sort of sigh. She looked as if she might faint away again any minute. She was a real delicate-looking woman, but it turned out she was a good deal stronger than poor Mrs. Bird. “ ‘And aside from the money, we were very anxious to have you come, my dear,’ says Mrs. Bird. “ ‘It isn’t any cat,’ says Mrs. Dennison. “’Oh, I guess it MUST be the cat; maybe she’s got a mouse,’ says Mrs. Bird, real cheerful, to calm down Mrs. Dennison, for she saw she was ‘most scared to death, and she was always afraid of her fainting away. Then she opens the door and calls, ‘Kitty, kitty, kitty!’ They had brought their cat with them in a basket when they came to East Wilmington to live. It was a real handsome tiger cat, a tommy, and he knew a lot. “ ‘What’s that? What’s that?’ says she. “ ‘What’s what?’ says Mrs. Bird, pretending to herself that she didn’t see what her sister meant. “ ‘It isn’t anything,’ says Mrs. Bird, but even as she said that she could see a little hand holding fast to that cat’s tail, and then the child seemed to sort of clear out of the dimness behind the hand, and the child was sort of laughing then, instead of looking sad, and she said that was a great deal worse. She said that laugh was the most awful and the saddest thing she ever heard. “ ‘What’s your name, little girl?’ says she. “ ‘Where do you live, dear?’ says Mrs. Bird. “’I can’t find my mother,’ says the child. “She tried to catch the child. She had an idea of putting a shawl around it and going out—she was such a little thing she could have carried her easy enough—and trying to find out to which of the neighbours she belonged. But the minute she moved toward the child there wasn’t any child there; there was only that little voice seeming to come from nothing, saying ‘I can’t find my mother,’ and presently that died away. “It was an awful thing. That child had lived in the house with her father and mother two years before. They had come—or the father had—from a real good family. He had a good situation: he was a drummer for a big leather house in the city, and they lived real pretty, with plenty to do with. But the mother was a real wicked woman. She was as handsome as a picture, and they said she came from good sort of people enough in Boston, but she was bad clean through, though she was real pretty spoken and most everybody liked her. She used to dress out and make a great show, and she never seemed to take much interest in the child, and folks began to say she wasn’t treated right. “Well, one morning that man that there had been whispers about was missing. He had been gone quite a while, though, before they really knew that he was missing, because he had gone away and told his wife that he had to go to New York on business and might be gone a week, and not to worry if he didn’t get home, and not to worry if he didn’t write, because he should be thinking from day to day that he might take the next train home and there would be no use in writing. So the wife waited, and she tried not to worry until it was two days over the week, then she run into a neighbour’s and fainted dead away on the floor; and then they made inquiries and found out that he had skipped—with some money that didn’t belong to him, too. “But that wasn’t all. The father came home, right in the midst of it; the child was just buried, and he was beside himself. And—he went on the track of his wife, and he found her, and he shot her dead; it was in all the papers at the time; then he disappeared. Nothing had been seen of him since. Mrs. Dennison said that she thought he had either made way with himself or got out of the country, nobody knew, but they did know there was something wrong with the house. “ ‘It seems to me sometimes as if I should die if I can’t get that awful little white robe off that child and get her in some clothes and feed her and stop her looking for her mother,’ I heard her say once, and she was in earnest. She cried when she said it. That wasn’t long before she died. “Now I am coming to the strangest part of it all. Mrs. Bird died very sudden. One morning—it was Saturday, and there wasn’t any school—I went downstairs to breakfast, and Mrs. Bird wasn’t there; there was nobody but Mrs. Dennison. She was pouring out the coffee when I came in. ‘Why, where’s Mrs. Bird?’ says I. “ ‘Abby ain’t feeling very well this morning,’ says she; ‘there isn’t much the matter, I guess, but she didn’t sleep very well, and her head aches, and she’s sort of chilly, and I told her I thought she’d better stay in bed till the house gets warm.’ It was a very cold morning. “’Maybe she’s got cold,’ says I. “ ‘Why, Abby’s crazy!’ says she. ‘There she is out this bitter cold morning, and—and—’ She didn’t finish, but she meant the child. For we were both looking out, and we saw, as plain as we ever saw anything in our lives, Mrs. Abby Bird walking off over the white snow-path with that child holding fast to her hand, nestling close to her as if she had found her own mother. This entry was posted in Free Fiction, Halloween on October 25, 2013 by admin.